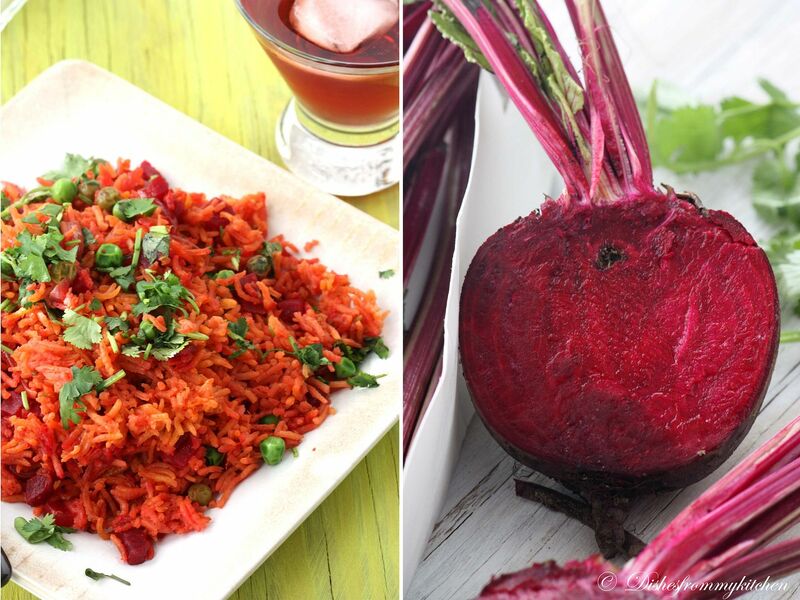 Dishesfrommykitchen: BEETS RICE - AN AWESOME LUNCH BOX MENU !!! 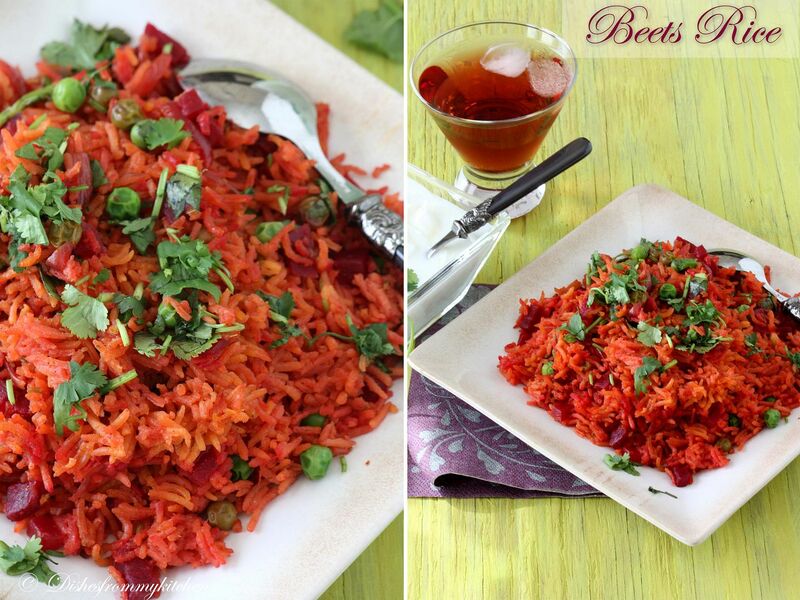 Beets and Green peas are wonderful combination for making Curries and Rice. The sweetness in both the veggies gives wonderful taste for the rice. This lunchbox menu can be prepared in no time. If you have not tried yet try this once. 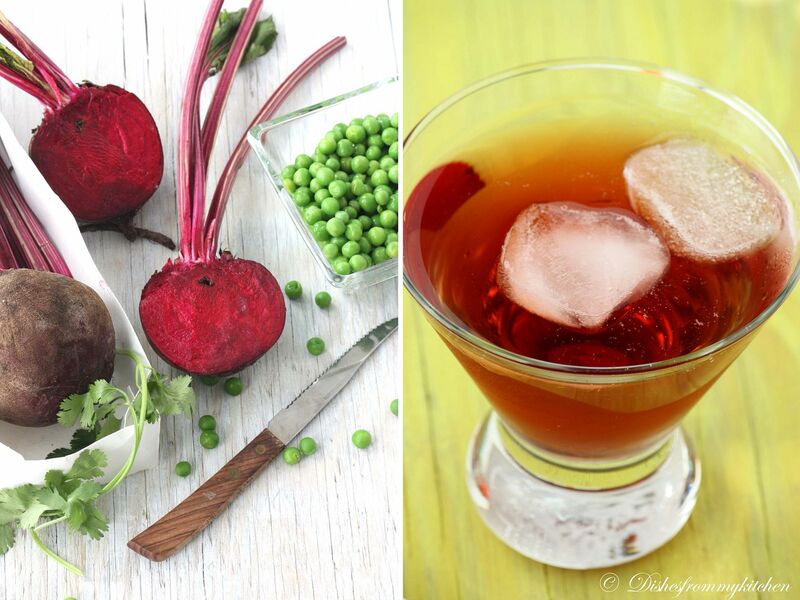 I am sure you will love this in ways of both taste and the beautiful color. 1. Heat oil in the pressure pan, add the whole spices. 2. Make paste out of ginger, garlic and saunf. 3. Now add the sliced onion, once it is slightly browned. 4. Add the ground paste. Fry till the raw aroma disappears. let them get soaked while we are frying the veggies. 6. Now add the Tomatoes, chilli powder and turmeric powder. 7. Sauté them till tomatoes are mushy and starts leaving oil. 8. Now add the Beets and sauté for few times. 9. Now add the soaked rice, and 1 1/2 cup boiling water. 10. Check for salt. Close with the lid. 11. Keep the flame in the medium. 12. When the steam starts coming, reduce the flame to very low. 13. Put the whistle. And let them be in the low flame for 10 to 12 Minutes. 14. Mean while Microwave or cook the green peas with little salt separately. 15. After 10 minutes open the lid of the pressure pan, slightly loosen the rice with fork (Don't over mix it), add the green peas and finely chopped coriander. Serve the colorful, healthy and tasty rice with Raitha of your choice. I am in love with that color, delicious looking rice. Lovely colour! Love this kind of variety in rice dishes.Amazing pics Pavi! Very healthy and yummy looking rice. Wonderful preparation.Simply loved the color of the rice. Healthy and colourfulrice, love the addition of green peas to it. I too make this with grated beetroot poriyal mixed with rice... But your version looks like a great one-pot meal... I made this for lunch today right away (with lil tweaks) with some raita and thovaiyal... Yumm!! Thats indeed a perfect lunch box item.. 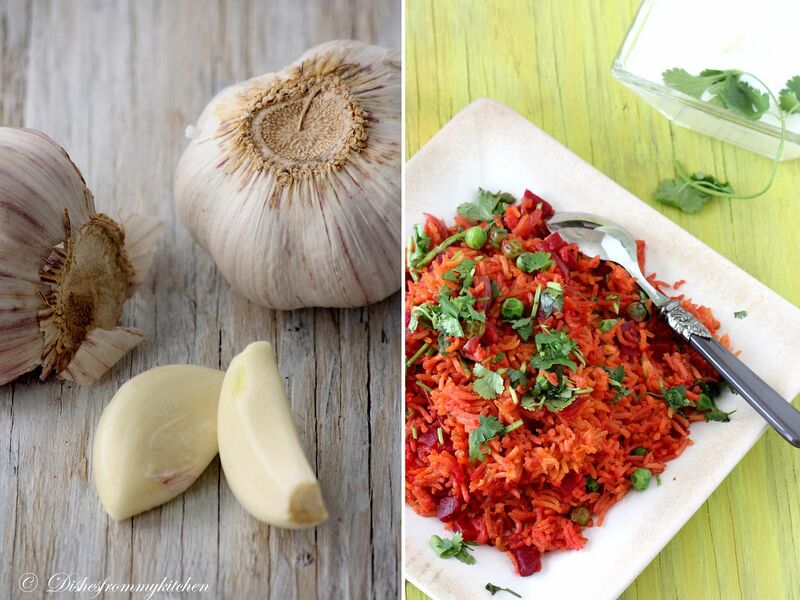 Loved the healthy rice idea..the color looks wonderful..and so the pictures..
colourful and healthy rice, loved it.. Such a gorgeous color ~ love love this rice! Luscious looking rice .. yummy. 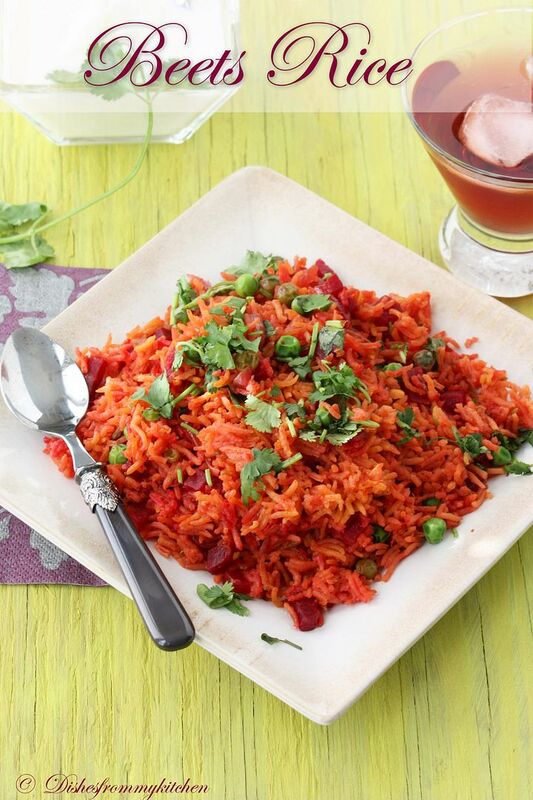 Wat a flavourful,colourful rice, fabulous one pot meal..
Love the recipe n the gorgeous pics !!! I used to take this rice for lunch box from my mom. Love it pavi. Bright color of the beets is so appealing. Pics are great. Though I have not had the chance to see all your recipes, I must admit that I have enjoyed reading the few I have already gone through. Keep up the good work. Awesome recipes, U really have a beautiful space. Glad to follow you.